The FTSE closed at 6700 yesterday, down over 200 points. I am not expecting many updates today from shares within my coverage universe but in the meanwhile, feel free to comment on the stories you're focusing on. This miniatures company jumps back over the £1bn valuation mark after an update that is in line with expectations. The share price had suffered in October following a cryptic (but typical for the company, I understand) update in which it said "there are some uncertainties in the trading periods ahead" (!). Numbers today show that H1 sales have improved to £124 million (FY 2018: £109 million) and operating profit has improved to £41 million (FY 2018: £38 million). The October trading update said that profits were running at "a similar level" to the prior year. The improvement which has actually been achieved in H1 will have come as a pleasant surprise to holders. It's unorthodox but I find this company's reporting style quite refreshing. It seems as if the CEO isn't terribly interested in providing guidance in terms of financial forecasts, or in predicting the future, full stop. Forecasts very often turn out to be wrong, anyway - so maybe there is no harm in having a CEO who admits that the future is uncertain and he doesn't really know what the numbers are going to look like a year from now. These results show the Warhammer Hobby is in great shape in our core markets. We have built on the progress we made last year and the results are considerable given the backdrop of major projects; increasing factory capacity and ERP system implementation. Here's an example of a product displayed prominently on its website today. It's 6 inches tall in real life. Can you guess how much it costs? £65 for this creature, which is assembled and painted by the customer rather than by Games Workshop! "So keen are the people who play these games that if you put the shop 100ft under the ground in an old coal mine, they would still find them". I was amused by that comment on Games Workshop (LON:GAW) at the time. He clearly doesn't quite 'get' the clientele; as someone that played this kind of games in my youth I have to say that the opportunity to play these games in a mine (Moria anyone?) would have been something I would have paid good money for. An opportunity for Games Workshop maybe? Given a slow news day, if MJ Gleeson is covered, is it possible to do a housebuilder special? The sector is starting to look very cheap with some ridiculous yields. Personally I think Barratts, persimmon and Taylor wimpey are looking good as debt free, particularly Barratts at 1*book, 1.3*the, which I would suggest is the right measure for such asset intensive companies, and regionally diversified / biggest. Of course there is an elephant in the parliament! Thanks for the requests - Games Workshop (LON:GAW) is now done, including a bonus picture of an Adeptus Titanicus Warlord Battle Titan With Plasma Annihilator and Power Claw. I did my own little investigation into Housebuilders a couple of days ago and I plumped for Redrow as my best bet. I think the majority are undervalued and unloved at the moment and there must be a correction soon. The 4th Quarter used to be known for Builders to perform but not so much this year. I am really keen on Games Workshop (LON:GAW) too.... I think it's a great business. My only reservation is the valuation, which is pricing in growth. It has been niche, and I think it always will be niche. Pandering to the mainstream in search of acquiring more customers might see it lose the advantages that it has gained, and something else might then fill the gap. The creator of Warhammer (Rick Priestley) left in 2010 citing that the balance had tipped.. would much of the advantage they have be in its people? 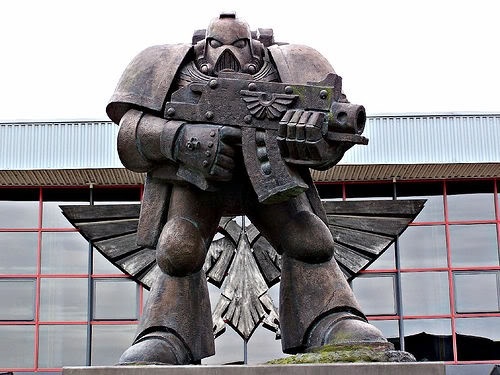 I guess this figure outside Games Workshop (LON:GAW) HQ would take quite a while to paint. P.S. Not sure if this one is still there. Redrow looks good and yield level doesn't imply a cut. From my perspective I'd prefer reduced London exposure since I am personally exposed to the region. Same reason I would prefer Gleeson over an Inland. That's "Mister" Adeptus Titanicus Warlord Battle Titan With Plasma Annihilator and Power Claw to you, sir. GW is a great company, no fannying around with irrelevant stuff, just knows its product, market and audience and continues to deliver to them. I don't think they are a takeover target though, all the other mainstream games companies sell more "family friendly" stuff, and plasma annihilator inquisitors are just that bit off from their audiences. It'd be a bit like Disney buying Ann Summers. Games Workshop (LON:GAW) > " it is difficult to see Games Workshop (LON:GAW) annual sales being less than £260m versus the forecast £234m." If you model up H1 last year to this years with same % growth forecast for H2 is closer to £250m - still a beat. Just a quick anecdote from my visit last night to a store to demonstrate the commitment of a Games Workshop (LON:GAW) customer. There's a recent Age of Sigmar spin-off collector card game produced by PlayFusion (under licence) and sold in both GAW and Independent stores. Due to unspecified distribution issues stock was briefly delayed by a couple of days in the local store, the customer I was chatting to formed a posse and drove across the Pennines to an independent store and purchased over £500 of stock immediately rather than wait a couple of days. "Games Workshop (LON:GAW) > " it is difficult to see Games Workshop (LON:GAW) annual sales being less than £260m versus the forecast £234m." "If you model up H1 last year to this years with same % growth forecast for H2 is closer to £250m - still a beat. FYI, last year was exceptional in terms of the H1/H2 sales split because of the H1 40k release. To get to £260m I assumed H2 to be 10% ahead of H1 which is relatively conservative based on past history. it is astonishing that clients spend hundreds on the game , then more on the paint , and more on scenery , which they then paint themselves. ive looked in several shops and been impressed by the staff. the shares were available under £10 less than 2 years ago . i bought . Ted Baker (LON:TED) RNS 3 mins before market closed!!!??? I just hit sell all at that point for a decent loss. Will buy back in at some point if things turn for the better. Rather naughty from Ted Baker (LON:TED). Why release the RNS before the market close? It's not as if anyone is going to forget about it on Monday morning. I feel sure this will be the end for Kelvin, taking a similar way out like Sorrell did ... a quiet departure in exchange for the investigation somehow running into a dead end. I'm guessing there will be some stories in the Sunday papers about Ted Baker (LON:TED) so they decided to act before they are published. The way I read this was that if an investor wishes to protect their investment and give the Quadrise Fuels International (LON:QFI) board some more time to follow through with their current strategy then they will subscribe to the offer. I guess some may have even sold some shares to free up cash to do this. This is a 'jam tomorrow' share but the potential pot of jam is enormous.